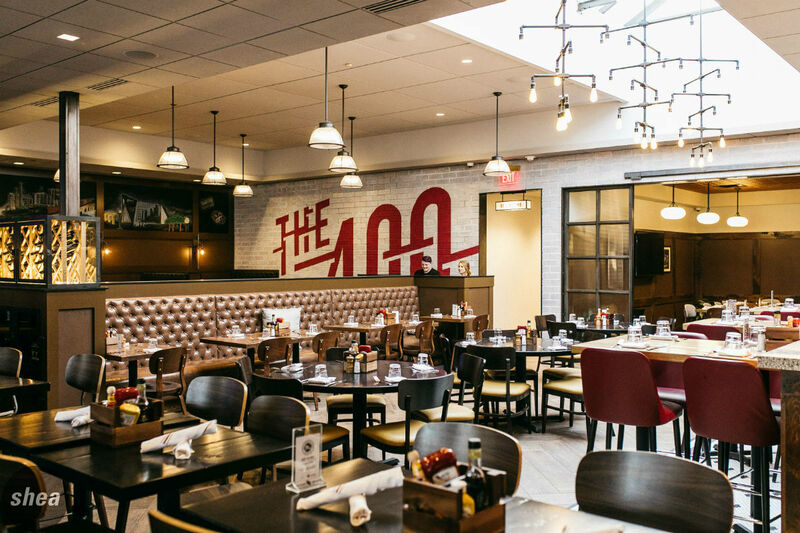 Twin Cities 400 Tavern completely revolutionizes the notion of a “hotel restaurant,” bringing a new level of both comfort and class to the forthcoming Delta Marriott in Northeast Minneapolis. With a renovation in progress to become a fixture of the newest upscale, full-service brand from Marriott, the former Ramada Plaza was in need of a chic new restaurant that would be in keeping with the Delta image. Shea partnered with Marriott and the hotel owners to create a design and brand that would be chic but still widely appealing. Embracing its locality, Twin Cities 400 Tavern has definite Minnesota flair, from the rail-inspired décor to the local beers on tap. The all-season patio space, encased in glass and featuring an “outdoor” bar and community table, is a glowing jewelbox at night, and inside, there’s always space to settle in at one of the cozy banquettes.